A series of massive infrastructure projects are now merging transport, energy, water and telecommunication networks across the nine cities of Guangzhou, Shenzhen, Dongguan, Zhaoqing, Foshan, Huizhou, Jiangmen, Zhongshan and Zhuhai into a single megacity. A 50-kilometre-long bridge and tunnel will join the PRD to Macau and Hong Kong. This area includes the “special economic zones” designated by China in 1980 to fast track foreign investment in manufacturing facilities for export. The PRD covers just 0.5% of the land area of the People's Republic of China, but is responsible for 20% of national GDP, more than 30% of foreign direct Investment, and 40% of China’s exports. In 2012, the ports of Guandong Province handled more than 1.2 billion tons of freight. The World Bank has named the PRD as the biggest urban area in the world measured by population and geographical size, usurping greater Tokyo. The area of the PRD is 8000 square kilometres. Its current population is 42 million people. The greater PRD as defined by Chinese authorities (to include Hong Kong, Macau etc) is far bigger still with 65 million people. The projected population by 2025 is 90 million, and 120 million by 2050. Of the total area, almost half (3720 square kilometres) is within 2 metres of mean sea level. Guangzhou alone is likely to have a population of more than 10 million people exposed to flood risks by the 2070s with just a 0.5 metre sea level rise. Future exposed assets in Guangzhou by 2070 are estimated at $US3350 billion. It has been estimated conservatively that the sea level will rise a further 20 cm in the PRD by 2050, making more than 2000 square kilometres of coastal low-lying land vulnerable to tidal inundation. This estimate appears conservative, and the vulnerable area could be much greater (see below). As well, coast wetlands which can mitigate flooding impacts are being reclaimed for new industrial land, which will worsen the impacts of flooding events. Researchers Faith Ka Shun Chan, Gordon Mitchell and colleagues say that the PRD is clearly subject to significant coastal and pluvial flood risks, but “to date relatively little attention has been paid to strategic flood risk management, particularly that which recognizes the pressure from climate change and the difficulties and dangers of relying on project based engineering flood defences” (emphasis added). 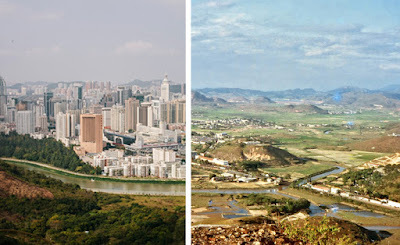 This is exemplified by 2011 Guangdong Province Housing and Urban-Rural Department report on strategic housing provision in the PRD to 2050 “which does not consider existing flood risk or the additional risk that comes with a changing climate”. PRD authorities have advanced flood risk modelling, but it seems the results have not been made available to the public or insurance companies, making preparations for flooding impacts more difficult. Many flood mitigation project are ad hoc, and do not include proper consideration of climate or ecological impacts. Planning and flood management institutions are structurally separated. The PRD is characterized by a tropical-subtropical monsoon climate. Typhoons, storm surges, tidal changes and intense rainstorms are common during the wet season of May to September. Climate change is generally agreed to have increased the frequency, intensity and magnitude of extreme weather events. The Hong Kong Observatory recorded 39 typhoons for the Pearl River Delta (PRD) in just one two-year period. Scientists reported 41 storm surge incidents of between 1.9 to 2.6 metres in the PRD between 1991 to 2005. Recent study estimates that a sea-level rise of 30 cm by 2030, accompanied by a one in 100 year storm surge, would inundate more than 80 per cent of the land area in the PRD (6,520 sq. kms)… with economic losses of 231 billion RMB (US$ 30 billion). However, flood defences to protect against this event are estimated to cost 262 billion RMB (US$ 35 billion) because the coastal area is large and diverse, which means that a hard engineering approach to coastal flood risk management is likely uneconomic and unable to protect all properties and economic assets located on coastal low-lying are in the delta (emphasis added). If these cities (in the PRD) are treated as a mega city region, we see that the region has the second greatest (after Kolkata) number of people estimated to be at risk of flooding in 2070 than anywhere in the world, with the most economic assets at risk (US$4.7 trillion in 2070). A 2011 study estimated that, with sea level rise at IPCC’s upper predicted limit (590 mm by 2100), a one-in-100-year storm surge would place 362 million people at risk across Asia’s delta cities. It should be noted that the IPCC estimates of likely sea-level rise by 2100 are unreasonably low. The PRD regional sea level rise has been 4mm/year from 1959-2011, or ~200mm over that period. Chinese scholars estimate that by 2050, regional sea-level rises in China’s three most vulnerable regions will be 500- 900 mm. They say that: “If so, large areas and a great number of cities over there will be beneath the sea water despite of all the present tide-and-flood control facilities” by mid-century (emphasis added). And by 2050, they say the PRD area may see a relative sea level rise of 500-600 mm. This would induce once-in-100 years floods to take place every 10 years on average. The worst-case scenario in the 2007 IPCC report, which looked mostly at thermal expansion of the oceans as temperatures warmed, projected up to 0.59 metre of sea-level-rise by century's end. 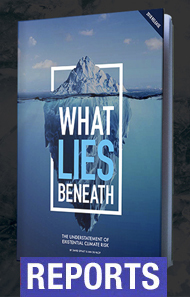 In an extraordinary verbal contortion, it then said it did "not assess the likelihood, nor provide a best estimate or an upper bound for sea level rise… The projections do not include uncertainties in climate-carbon cycle feedbacks nor the full effects of changes in ice sheet flow, therefore the upper values of the ranges are not to be considered upper bounds for sea level rise. They include a contribution from increased Greenland and Antarctic ice flow at the rates observed for 1993-2003, but this could increase or decrease in the future." 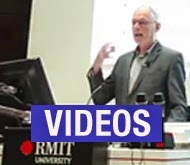 Yet in early 2007, sea-level specialist Stephan Ramstorf had presented a "semi-empirical relation…that connects global sea-level rise to global mean surface temperature" which resulted "in a projected sea-level rise in 2100 of 0.5 to 1.4 meters above the 1990 level". By 2009, various studies offered drastically higher projections than the IPCC. Australian Government reports noted: "Recent research, presented at the Copenhagen Climate Congress in March 2009, projected sea-level rise from 0.75 to 1.9 metres relative to 1990, with 1.1–1.2 metres the mid-range of the projection”. Extraordinarily, in 2013 the IPCC assessment report repeated the mistake and actually produced a numerically smaller figure (0.55 m as compared to 0.59 m in 2007) despite mounting evidence of polar ice mass loss: "Global mean sea level rise will continue during the 21st century, very likely at a faster rate than observed from 1971 to 2010. For the period 2081–2100 relative to 1986–2005, the rise will likely be in the ranges of 0.26 to 0.55 m for RCP2.6, and of 0.45 to 0.82 m for RCP8.5." 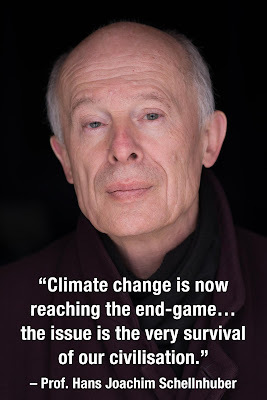 And then, having noted estimates for sea level rise to 2100 of between 1.15 metres and 2.4 metres, the report said: ”Considering this inconsistent evidence, we conclude that the probability of specific levels above the likely range cannot be reliably evaluated." If some work could not be “reliably evaluated”, how could they be sure of the much lower estimates which they had quantified? This event completely shot any shreds of IPCC credibility on sea-level rise that may have lingered after 2007. The fact of the matter is that today the discussion amongst experts is for a sea-level rise this century of at least 1 metre, and perhaps in excess of 2 metres. Evidence from Rignot, Mouginot et al that Antarctica by itself has the potential to contribute more than a metre of sea-level rise by 2100, and that at less than 1°C of warming, West Antarctic glaciers are in “unstoppable” meltdown for 1-4 metres of sea-level rise, only add to grave concern that the IPCC reports are simply irrelevant on this matter. As noted earlier, almost half of the PRD is less than 2 metres above mean sea level, yet by the second half of this century sea-level rise that may well approach this level, and topped by large storm surges this would inundate what is now China’s industrial heartland. But the impacts are already being felt, and may become significant in the next few decades, not in a century. 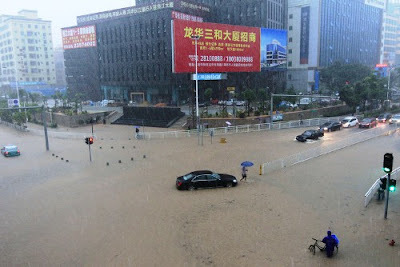 One simulation by the China Meteorological Administration in 2002 suggested that a historical high tide, combined with sea level rise of 65 cm, would lead to flooding of about 3400 square kilometres of the PRD. The Hong Kong Observatory says that with a 48 cm sea level rise, the flood level with a 50-year reoccurrence interval would be shortened to a return period of about three years. If the water level were to rise to 88 cm, then a 50-year event would become annual. It seems astounding that the Chinese government could oversee such a disaster-in-waiting as the rapid industrialisation of the Pearl River Delta. The PRD megacity looks like planned insanity. Developments are going ahead without any systematic reference to climate change impacts. Will the PRD, when it is inundated too often, simply be abandoned after government policy has overseen the inward migration of up to 120 million people to the area by mid-century? Perhaps then it will be said that China’s manufacturing heartland was sunk by a catastrophic failure of government planning and the failure to integrate known climate change impacts into economic and climate policy. Hong Kong”, International Journal of River Basin Management 4:5–15.